The quality of Elvis' performances during the last few years had gone up and down like a yo-yo. The broken down marriage, the numerous years as a sort of day-and-night shift worker with superstar status was too demanding. The human organism is not made to sleep all day or all night with the aid of sleeping tablets, or to be kept artificially awake by 'uppers'. Sooner or later this kind of life hits back. In College Park, Maryland, Elvis started his 12th tour. His first show at College Park was a disaster. 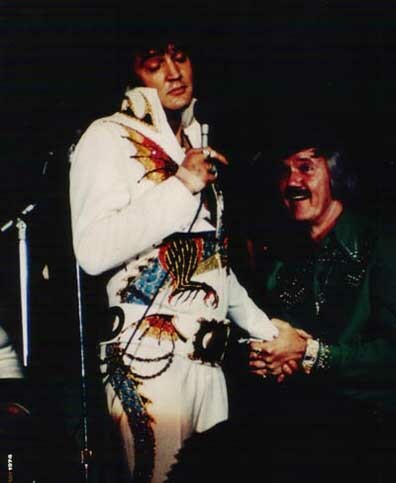 Elvis held poor shows before, but this wasn't poor, it was abysmal. His singing is at times downright awful, and 'Bridge Over Troubled Water' sounds gratingly false. But on October 6 Elvis played Dayton, Ohio. Unlike just a week prior, Elvis flies high on the collective spirit of 13.500 fans attending the gig. It's obvious from the moment Elvis hits the boards that Dayton is wild for the man from Tennessee. Elvis dances through his usual set openers like 'C.C. Rider', playing the crowd's affection, hard. The University Of Dayton is awarded three more songs than earlier in the day, including Presley taking a spin on acoustic guitar for 'That's Allright, Mama' and 'Blue Christmas' ! "I have a lot of people that ask me if I play the guitar and the answer is no...I mean, uh, yes I can!" Elvis claims. And he backs up those words. His very first single from 1954 is given a nice ride, Presley even asking the band to slow it down a bit. What a treat! Most of his other 50's tunes are run through with the same unfortunate casualness that makes one wonder why he sings them at all. Presley chooses to dig down, in his own magical way, on the uptempo blues of 'Big Boss Man' and both of Olivia Newton John's current hit singles, 'If You Love Me (Let Me Know)' and 'Let Me Be There'.